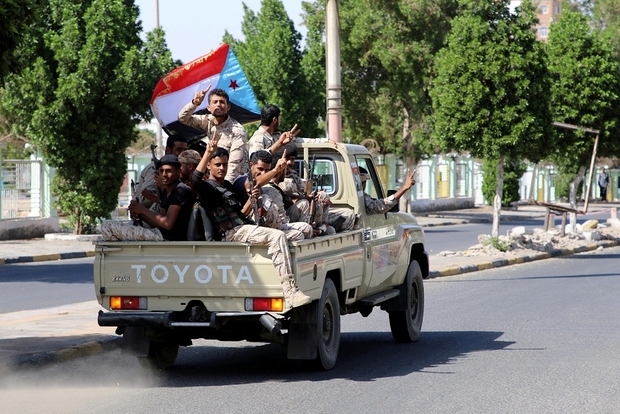 After three days of fierce fighting, the Southern Yemeni secessionists took control of key areas in Aden, the interim capital of the internationally recognized government led by Saudi-Ally Abd Rabbu Mansour Hadi. Leaders of Yemen’s Saudi-backed government are reportedly preparing to flee from Aden as southern separatists consolidate power in the city. With Back-up from the UAE, the Southern Transitional Council (STC) has found new opportunities in Yemen’s chaos to forge ahead with its secession goal which it has been striving to achieve for years. The UAE support for southern separatists has caused cracks within the Saudi-led coalition to thwart the Iran-backed Houthi rebellion in the north. Emboldened by its increasing support base, the STC gave President Abd-Rabbu Mansour Hadi’s government an ultimatum – either dismiss the Prime Minister, Ahmed bin Daghr, and his cabinet or face being overthrown. The STC, formed last year to push for the revival of the former independent state of South Yemen, seized the last stronghold of its Presidential Protection forces rival in Dar Saad area in northern Aden in battles that at times involved heavy artillery and tank fire. Over the last three days, an International Committee of the Red Cross (ICRC) official said more than 36 people had been killed in the fighting in Aden. The hostilities in Aden erupted early on Sunday when pro-government troops prevented STC supporters from entering the city for a rally. Separatists have dispatched additional forces from the central province of Marib and the southern province of Abyan, security sources said. The forces from Abyan marched on Aden after clashes with loyalists on the way. Written by: Jaber Ali on January 30, 2018. Posted by Jaber Ali on Jan 30 2018. Filed under Gulf News, Headlines, World News. You can follow any responses to this entry through the RSS 2.0. Both comments and pings are currently closed.